Is OpenSignal The Best Mobile Coverage Map? London-based OpenSignal claims to publish the only unbiased mobile service coverage maps to help consumers make informed purchasing decisions. The company also publishes reports drawn from its millions of real-world mobile monitoring stations -- the smartphones that run the OpenSignal app. The app reports to OpenSignal the phone’s location, the network to which it’s connected, the actual data speed and latency of the connection. It does not collect data that would identify the user. This crowd-sourcing paradigm has enabled OpenSignal to collect billions of data points from 15 million copies of its app that have been downloaded since its release in 2010. In January 2019, OpenSignal published their annual Mobile Network Experience report, which rates Verizon as the winner in the 4G Availability (94.2%), Video Experience, and Upload Experience categories. Verizon and T-Mobile tied in the Download Speed Experience category, and AT&T took honors for the network with the lowest Latency. (Latency is a measure of network lag, so lower is better.) The report stressed that T-Mobile was a very close second in each of the categories where they rated Verizon as the winner. Sprint scored last in all categories, in contrast to their TV ads touting network reliability. Most users are in urban areas, so OpenSignal’s data is skewed in that direction and under-reports data from rural areas. OpenSignal’s sample is not randomly selected, as the sample for an ideal experiment should be. But that doesn’t make OpenSignal’s coverage maps useless. If you live in an urban area, as 80% of the U. S. population does, OpenSignal maps provide a good prediction of what a given carrier’s coverage and signal quality may be. If you don’t drive into the boondocks very often, you won’t miss rural coverage. Dead zones may not be measured, but the absence of data points in a given area certainly implies the existence of a dead zone. I recently moved to a rural area, and was pleasantly surprised to see that OpenSignal's coverage map was quite comprehensive. I was able to confirm that Verizon has a good strong signal, T-Mobile is a close second, and neither Sprint nor AT&T would be a good choice here. Overall, OpenSignal is a useful tool for the vast majority of users, and it is free of the perceived bias that attaches to professional tests paid for by the company that stands to benefit from the test results. The OpenSignal mobile app will help you improve your mobile signal, and recommend the best mobile operator in any area. The signal pointer will tell you which direction to go in order to find a stronger signal. By installing it, you'll be part of a collaborative effort helping others get a better signal too. Sensorly is a similar tool, promising "Unbiased, Real-World Mobile Coverage" from "people just like you." I tried Sensorly, and found that the coverage maps for my area were similar, but it reported a much stronger signal for Sprint than OpenSignal did. Again, this probably has to do with the fact that I live in a rural area, and the number of people self-reporting is smaller than in more populated areas. I liked the fact that Sensorly lets you view their coverage maps on the Web, without downloading an app. Which carrier has the best signal in your neighborhood? If you're in the market for a new mobile provider, you might want to consult the coverage maps from both OpenSignal and Sensorly. Even better, ask your neighbors which provider they have, and how they rate the coverage. Your thoughts on this topic are welcome. Post your comment or question. Most recent comments on "Which Mobile Carrier Has the Strongest Signal?" I went to download OpenSignal, but it only has 2.6 Stars in the iPhone App Store. Lots of 1-star ratings, which gives me pause. I wasn't able to use the link for the OpenSignal mobile app - got a 404 page doesn't exist error. I'll search the App Store, and see what I find. Thanks for your writing - always interesting and useful! Update to previous comment- I downloaded the app, and like so many users who gave it a 1-star rating, there was no arrow to point to a better signal. I erased it off my phone. On my state of South Dakota are main cell company is Verizon. But we do have AT&T towers in some areas and not many. Verizon beats AT&T all the way here here and you loose your signal a lot with them. I have lost signal with Verizon very little, and only found very few dead spots. S.D. is very rural and has less than 800,000 people in the entire state. If your in the big cities AT&T might work well, but for the other areas they are not reliable at all and often do not even ring when called and of course if you call to see what is wrong you get excuse after excuse, they give you to truthful answer that their services at AT&T for the most part in my state or less than horrible. So I give Verizon 90% and I give AT&T less than 30%.. I use Verizon through Net10,for reasonable price. All others rob you, Net10 is $20.00 for unlimited text and calling in the USA..They use the Verizon network which is CDMA and some phones accept both technologies, at&T is GSM. If in my State the best is Verizon for reliability. Anything concerning cell signals is mostly dependent on the range from the user to the tower and any terrain or environmental factors between them. That said, I get GREAT signals on my T-Mobile personal phone, and not quite so good on my business phone on AT&T. T-Mobile is also better customer service and cheaper on my 55+ plan. Your experience matches mine. 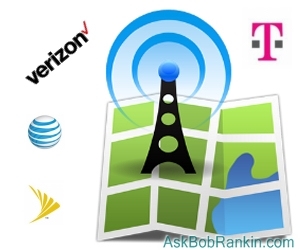 In most metropolitan areas, you can get pretty good coverage and speed with all the carriers. Each will be better or worse based on you specific location. If you live or spend a lot of time in rural areas, Verizon definitely has better coverage. Personally I use T-Mobile mostly because of great pricing (senior plan which gives unlimited everything for 2 phones at $60/month total -- no taxes or other fees). And in my area their speeds and coverage are good. But I have traveled to areas where they don't have good (or sometimes any) coverage (for example, at my sister-in-law outside of Reno). On a side note to my above statements, I put in open signal, and it gave me Three Awesome's, 46.2 Mbps Download, 10.1 Mbps uploads, and ping was 20 MS all excellent for cellphones,,, I am glad of that at least and this is using a LG smartphone with Net10. BillC, I use to use Tracphone and in my state it uses Verizon and in other states maybe something else. My problem is this with them, they are not honest or at least were not with me. I had over 7000 minutes and 8400 texts left on my cellphone when they had 3X minute plans. Someone broke into my account via their web site and closed the account, stole the minutes etc and I have no idea how they did it. I should have sued them so I was told. I did not get anywhere with them at all and I could not log onto my account and they did not seem to care. I went to another company which I find considerably more honest. To me Tracfone is nothing more than less than honorable. I got tired of arguing wih them as I was getting no where and told them to close the account and I would turn it over to a attorney. But they attorney said it was not worth it, they would keep it going through the courts to wear me out. I will never ever in this life time use Tracfone again and I am 72. As for the OpenSignal app, I have no problem seeing the arrow when I open it up. It's there on my iPhone. I can also see the cell towers populate when zoomed out, along with info about the towers in the next tab. It's an okay tool. The speed test seems to work well, and has no problem recognizing when I'm testing wifi vs. cellular. Always weird. I have several cell phones. One is on AT&T. The others (with maybe one exception) are on MVNOs but use AT&T towers. I live in an urban area but have traveled without ever losing a signal. The one exception is a phone that uses AT&T/Sprint towers (it won't tell you which at any given moment) and must be taken outside the house for a good signal. One other point: the Sensorly map for AT&T in my area shows moderately good coverage in the city and only coverage along highways in the areas outside. Is their coverage map really good? @BillC - TracFone uses T-Mobile, Verizon, AT&T and Sprint, depending upon the market. If you purchased your phone directly from TracFone, there may be a sticker with a code on the box or the phone to let you know which is used. For example, you may see something like CDMA-V, GSM-T or LTE-S (V for Verizon, T for T-Mobile, A for AT&T and S for Sprint.). If you purchased only a SIM card from TracFone to use in a phone you purchased elsewhere, you may have had an option of which to purchase. For example, when I was using StriaghtTalk (which is also a TracFone company,) I purchased the AT&T-based SIM card as I knew it would work best with the phone I had at the time. All that said, I eventually switched to T-Mobile. The pricing for two lines actually came out a few dollars cheaper once California began charging tax on the purchase of the monthly phone refill cards. T-Mobile (and all the big carriers) offer more with their plans than a MVNO such as StraightTalk could. The customer service is immensely better, as well. That definitely goes a long way. However, if it's only for one phone, I can see why a person would choose a MVNO. Individual lines on the big carriers are definitely higher than the MNVOs charge for one line. Thanks much to the folks responding to my question. I have the Moto Z Play phone with a Consumer Cellular Sim Card. CC uses the AT&T network. The good news is that I had 2 bars coverage in rural Texas (Ft. Griffin) when others had no coverage. The bad news is I was lucky to have one bar some of the time in Savannah, GA when my daughter had good coverage from Verizon. So, it all depends on where you need the coverage. Verizon has been the only reliable signal here in rural south central Kansas for many years but recently they have apparently dropped some power because we all have dead spots now around the county next to Oklahoma. I Googled "best cell phone for signal " and Samsung Galaxy S7 was at the top of the list and I can verify that when I got it, it beat all other peoples phones for ability to find signal but a few months ago all of us began to have problems here. It was rumored that Verizon was going to weaken the signal for savings out here and I believe it's happened. I’m in a rural area in MN. On one side of the lake toward a certain larger town, Verizon is excellent. On the other side of the lake toward a different smaller town, AT&T is better. Ends up there is an AT&T tower on the edge of town that just so happens to be at a good angle to hit my place right. I’m on Cricket owned by AT&T and have excellent service where I am and went far up north close to Canada, I have excellent service and conversely the Verizon people I know get no service or choppy service up there in the woods right next to me. By the way, I had Sprint before getting Cricket. It was completely worthless at my place. Slightly better in the winter when leaves were gone but too frustrating. When I lived in an Urban area prior, it was just fine of course. I used to use Open Signal all the time and partially used its information to choose AT&T. I always seemed to get reliable results. The only problem was in urban areas there were so many overlapping results. I used it on an Android device back then. I am not going to choose a different carrier. I get unlimited everything with 2GB fast for $30 / month flat. No extra fees or taxes. That is probably the biggest thing I do not miss from all the post paid major carriers I had in the past. “Oh, new surcharge fee, line use.... it’s on the back in fine print.” Never again! I buy my phones outright and I don’t care. I see how the mobile sales people make it sound like you can ‘save money’ paying monthly for the latest phone that comes out. If people would invest the amount they pay for the latest greatest phones, they could probably retire early. LOL OK. No more opinions from me. I understand the thrill of the latest and greatest. And bad phones probably cost people time having to wait for them to work but personally I like a happy medium. Buy a decent phone that is one or 2 generations behind but still decent and take care of it so it lasts 2.5 years or more. Sorry, got onto side topic. I’ll try Open Signal on my current phone iPhone X, and if anything stands out I’ll share it later. Here in Southeastern Oklahoma (rural area) we use US Cellular versus Verizon (although it does cover the same area).